The Euvis AWG414 modules generate dual arbitrary CW waveforms with sampling rates up to 4 GSPS. The on-board SRAMs provide up to 4M x 12-bit data memory to each channel. The AWG modules can be controlled by a PC via a USB interface or can work alone with pre-stored waveforms. The sole RF input is a single-ended clock source CK, which can be operated up to 4 GHz with minimum power of 12 dBm. The RF outputs of the module are comprised of two pairs of differential analog outputs, with 50-Ω back termination. The module accepts a high-speed trigger signal and generates three programmable marker signals. The waveform generation can be in continuous or burst/pulse mode. The waveform contents can be dynamically changed using the user page selection. 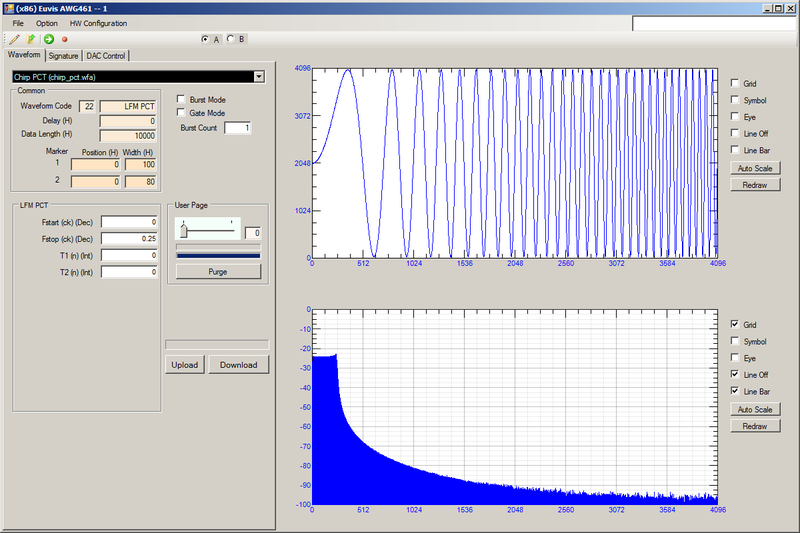 Programmable profile option facilitates compound waveforms. The companion API provides an interface for software development. For pricing information, please visit Pricing. » To download the AWG Software, API, and Manual, please click here. All AWG's use the same clock source, or use clock sources phase-locked to each other. If use internal clock, all AWG's must use the same reference clock. All AWG's use the same trigger signal. The trigger signal is phased-locked (aligned) to the /32 clock. The SYNCO signal is a /32 clock, which can be used to phase lock the trigger signal. Fine adjustment can be done by specifying the delay in common parameters to further minimize the relative delay of AWG's outputs. For details, please see synchronization.